Toward the beginning of time, during the creation of the world by the mother and father, the original god and goddess, they began to speak of and create their children. These would be the original of the lesser gods and goddesses. However, one more goddess was created to be one with the mother and father. Their daughter, Taokaka. While the Mother and Father took dominion over the realms of men and other sentient beings, and they gave dominion to their sons and daughters of more specific races and areas, Taokaka was given dominion over the wider realms of the forests. Centuries passed, and Taokaka did not properly follow the duties of a goddess. While the Mother and Father, and their lesser sons and daughters, went about their duties, protecting the races and shaping the world, Taokaka frolicked in her forests, playing with the animals and the plants that resided there. When called upon by the other gods and goddesses to act, she merely hid herself within her realms. When the Mother and Father told her she needed a following, Taokaka stayed with the animals and plants, peacefully fading into history. Over time, Taokaka ceased to be in the image of the other gods and goddesses, and even the Mother and the Father, and began to appear more feline in nature and physical appearance. Slowly, the people of the world forgot the most mischievous of the gods and goddesses. Those that entered her forests, mortals and lesser gods alike, were subject to mischievous pranks and quickly shunned from the forests. Over time, the mortals learned to avoid the forests and Taokaka disappeared from their history, only residing in the fading memories of the most ancient of the beings. The other immortals began to refuse to admit that Taokaka, Goddess of the Forest, existed. However, fading from the memories of mortals only had the most logical effect. Taokaka’s trickery and pranking upon humans, over time, became myth and legend. The sole reason mortals avoided her forests was the superstition that ran through them naturally. More centuries passed and the wood elves took up residence in the forest, along with the plants and animals. Taokaka, at first, harassed them with cruel pranks and tried to shun them from her realms. But the Wood Elves proved to be resilient in their convictions and stayed in their new home. They grew on the Goddess of the Forests and she began to treat them as children of her realm, just as the plants and the animals. However, even the Wood Elves began to forget her. She lived on in their memories, but they did not worship her. To them, she was but a force of nature. They knew she was there, but to them, she was not a Greater God, like the Mother and Father. Centuries went by and Taokaka moved about her forests, maintaining and loving her plants and animals. The Wood Elves stuck to themselves and their own gods and goddesses, and Taokaka allowed them to remain in the forests… For the sole reason that they respected nature and caused no harm to the forests themselves. The humans and other races continued to avoid the forests, from superstition and by the request of the gods and goddesses they followed, including the Mother and the Father. However, as all things go, there were mortals who began to cease to believe in the gods. The Atheists believed they were themselves the forces that ruled their destinies. In these beings, even the myths and legends surrounding the forests were lost. The stories of the Mother and Father. Of the Sons and Daughters. The Atheist mortals waged war upon each other, tried to take control of the lands. All of them. Taokaka’s realms were left alone… For a time. However, eventually, the mortals began to damage the forests. To harm them. They cut down trees radically, taking more than they needed. They killed more of the animals than they needed and wasted what they did not use. Taokaka began to feel pain and remorse at the loss of her children, and the pain her realms were caused. The Wood Elves tried to stand up against the invading forces, but alone they could not act. Taokaka’s acts of mischief alone would not repel the forces. No, they were taking her home and her children. Decades of this went by, Taokaka too irresponsible to take up her duties. The Mother and Father continuously told her to act like the Goddess they had made her to be. She resisted, only wanting to live with her children. It was not until the Atheists set fire to her most beloved forest, in what is now called Tohoku, to make a battle ground… It was then that the Atheists brought upon themselves and all mortals, save for the Wood Elves, the wrath of the Forest Goddess. Taokaka’s anger brought forth the memories of the Goddess who disappeared. The very trees uprooted themselves, the forest animals rose in anger and rebelled against the invading humans. The trees, plants and animals stood by the Wood Elves and helped defend the realms of forests. And when that was not enough, The Goddess Taokaka revealed herself to the humans, the Ondode… To all of the invading, destructive races. She imprinted herself forever in the memories of the individuals and their races. Taokaka restored her forests and forcefully repelled the invading races. Taokaka, in her rage, banished the mortals and spoke words that could be heard and felt through all races. *At this point, the texts is so smudged and damaged that it is unreadable. However, this appears to be enough information for any researchers to gather a reasonably full understanding of the Goddess Taokaka. If further information is needed, they can find it by entering the forests and finding the few followers that Taokaka keeps in her realms. Those that can speak to animals… Would merely have to ask the animals and other denizens of the forest. in the year A.E 1000 sometime between the Great War between Dragon-Kids and the sub-lower beings, Eflria was anointed by the Greater Gods to watch over the Dragon-Kids during their near extinction and he didn't object to such position and was set out to intervene the sides. Once the War was settled by mere diplomatic situations the Dragon-Kids were put back into hiding along with the Dragons but Elfria's job still wasn't done by mere settlement, no he had much bigger problems on his shoulders and the burden of being Lesser Demi. He lives quietly in the realm of Páistí na Cúig Eilimintí and so often sets out to do minor Earthly walks, being less restrictive than most of the Gods since he must make contact with the Dragon-Kids every few travels. He only seeks out most of the Dragon-Kids to come unto his Court he finds worthy to make duties if not minor roles, he holds atleast five Courts men of different Dragon-Kid race. Eflria's Dragon form is not big as the mountainous world sized Dragons that could eat a cityscape, no not this guy. 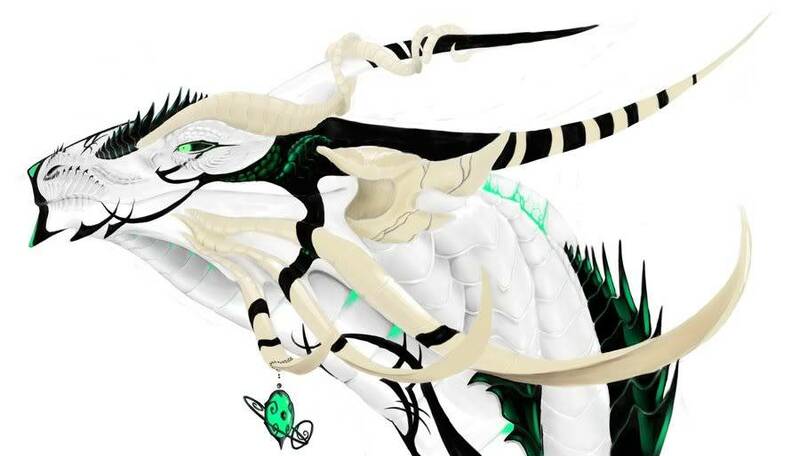 He is a slender white dragon with runes and black/green streaks along his body. He never uses his dragon form unless in dire provoked terms against his enemies enough to actually wound him down to near death. Nature: Fraeyal ushers the world into it's brief slumber of Winter, allowing the world to rest. She is a calm deity who seeks to instill a sense of peace and silence into the world. She destroys crops with her harsh cold, and brings death to those who do not prepare for the cold. She is closely aligned with the god of death. As the dulling cold of Autumn begins to further chill into the Winter months, Fraeyal begins to wax in power, her influence turning the land into a world of silence, and simple elegance. While some see Winter as a time of object death, in truth Winter serves the land by allowing it to have a time of rest. Winter is a time of reflection, training and togetherness as creatures and people huddle together in their warm places and wait for the world to reawaken. The cold months are a time of testing, in which mortals must survive on plans they set earlier in the year. However, those without the means or ability to secure shelter face Fraeyal's true wrath. Blizzards, cold rains, hail and freezes all test those stranded or traveling great distances during the Winter months and wildlife alike. Food is hidden beneath snow, layers of ice lay between cracked lips and water, and game is forced into hibernation or inactivity. Many an army has suffered losses from the creeping death that is Fraeyal's silent fury, and there will be many more who do not please her that will fall. The Lady of Winter encourages mortals to use this time to improve themselves, and to prepare themselves for the coming flurry of reawakened life. What time not spent in self-improvement or simple survival may be spent reflecting on the past, and internalizing the lessons of the past year. In many ways, the time of Winter is a time of preparation, regrouping and recharging one's will to go on. In others, it is a time of testing, endurance and survival. Fraeyal is most often depicted by mortal artists as thin woman with a somewhat malnourished looking body, but a healthy face that shows no emotion. Her clothing is usually shown as plain, but utterly and pristine white, in either pants and tunic or a simple robe. 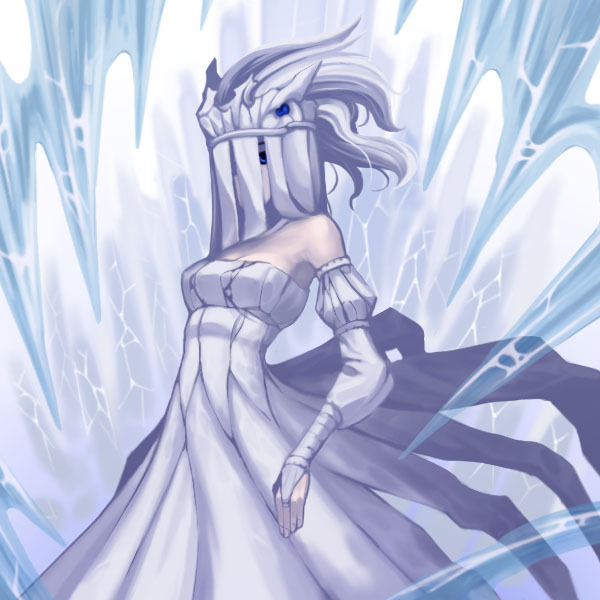 In some representations, she is also shown with icicles hanging off of her form. Fraeyal is said to wield Glacial Scorn, an icicle of clear ice of impossible thinness that resembles a rapier. This icicle is said to be able to find any weakness, so as to crack icebergs in half with a single puncture. Each wound inflicted by it spreads frigid cold, bringing living beings to a quick, still, silent death and grinding other entities to a halt. Being held by mortals without Fraeyal's permission will have it be permanently embedded on the skin that held it (over any covers) until the extremity falls off. Holy Symbols of Fraeyal resemble the stylized image of a snowflake. They are usually made from platinum, silver, ivory or, in the cases of the most devout of clerics, white ice (which remains unmelting as long as the cleric is true to Her). They remain cold even in the hottest climates. The church of Fraeyal is committed to spreading the ideals calm, controlling emotions, intense physical training and wilderness survival. They often teach techniques for survival to the public and are at the forefront of teaching combat and self-defense skills to the public. The church does not actively advertise these services, feeling that only those who truly wish to be taught will seek them out. Certain rumored followers of Fraeyal are said to wander to the icy landscape in search of victims to kill; those that might be judged to be too weak to carry on. These rumors are intensely demeaned by the church. 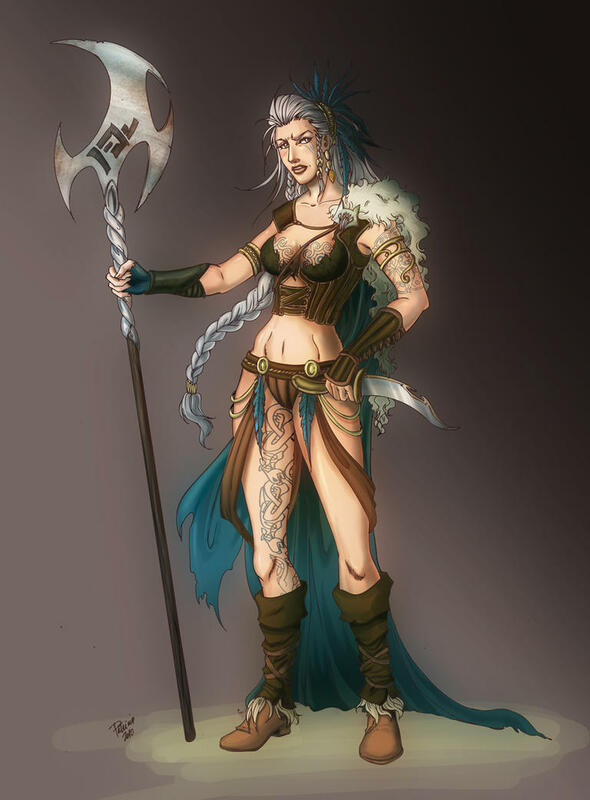 The Lady of Winter is worshiped by a wide variety of people, although many monks, rogues and swashbucklers follow her philosophies. Nature: Faergol is a smirking, laughing and smug deity who delights in playing tricks and pranks on mortals, just for the fun of it. While he takes his duty in death seriously, he has been known to allow a handful of mortals he likes to escape his clutches, especially when they amuse him. He has also been known to lure those he does not like into his hands. Death's sense of humor is twisted and often of a sarcastic type. He encourages mortals to spend time alone, and in silence, as these are best times to play his tricks onto them. Death is, for the vast majority of the creatures of the world, the final experience of reality which mortals experience. In time, it will come for all things, regardless of their deeds or accomplishments. The mortals of the world know death all too well, and have experienced it second hand through the deaths of many people and things around them. For some, it is a welcome release against the pains of life, while others rage against it until the moment that the dagger of death severs their soul from their body. Death is a return to the world of darkness, it is said, in which Faergol holds the souls of the dead for a time before ushering them to their rewards in the personal realms of their chosen deity. This darkness, and all darkness, is an essential part of the world, hiding secrets, and ideas never meant to be known, from mortal minds. The darkness is at once a place of great danger and great protection, shielding those who know and respect it from the bite of death. Faergol is nearly always depicted as a heavily robed, almost shapeless figure with a hooded and featureless face - except for a grin. The exact sensation that this grin gives varies widely, although many see the grin as a laughing one. Faergol is often depicted holding Shroud's Fang. It is a small serrated dagger that appears to be made of blackened bone and dyed in dried blood. Its slightest wound is said to sever a soul from a living body. Mortals who find Shroud's Fang never realize what it is until they have completed His task or fail him, in which case it bites at their souls. Holy Symbols of Faergol are usually carved in the abstract shape of a skull, either by blackened bone, clear ivory or dead ebony. It is common for the interested cleric to request the task from a crafter due to the difficulty of handling the materials, but it is not uncommon for His clerics to pick up such skills for that reason alone. In the hands of a devout cleric, the eyes of the skull will seem to follow the observer wherever he or she may be. The church of Faergol's most important duty is the protection of the dead after they have died. The church is often in control of crypts and cemeteries which they tend with utter solemn obedience. The cleric often offers cheap funeral services for any family that can afford one. However, these clerics make up only a small part of Faergol's most devout followers. Any other aspects of the church are not recognized officially. Faergol has many sects and cults centered around him, although finding them is often an challenge. 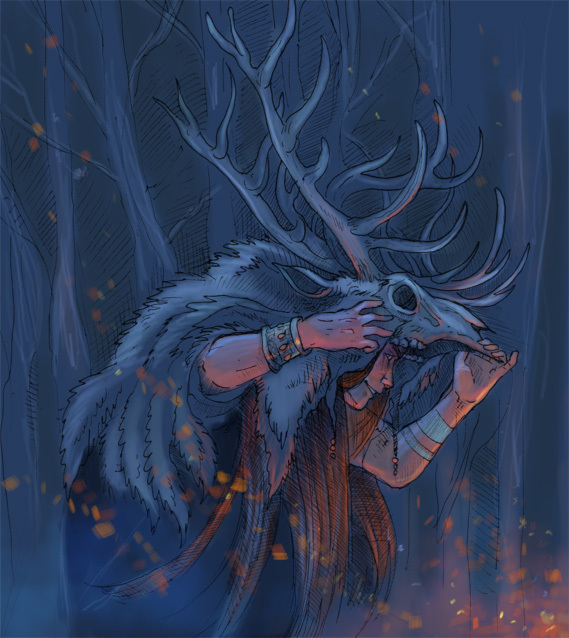 Many of his clerics also live lives as hermits, and shamans often serve him as well, hunting down any spirit or soul that may have somehow escaped his grasp. The Lord of Death is commonly worshiped by hermits, shamans, assassins, caretakers of the dead, rogues and tricksters of all kinds. Nature: Sayuri is a warm and kind, although accepting all the things that life brings. She acts as a mother figure, at once kind and nurturing but also stern in her quest to improve the behavior of mortals. 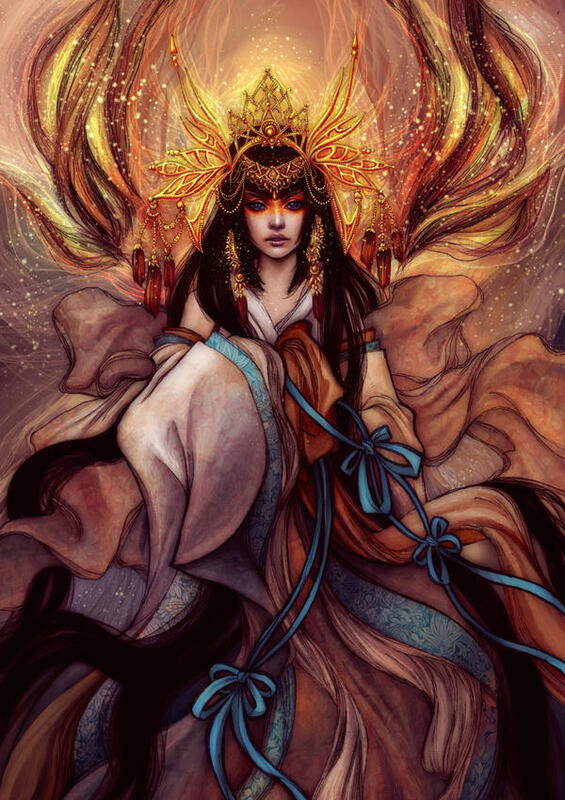 Sayuri is the goddess of love, fertility, and beauty. Though she may be a bight vain and flightly, she loves all the creatures in the world despite their morality or alignment as she considers them all her children. It is her duty to create beauty within the world and make it a much more attractive place. Those that dare destroy the beauty that she creates create an direct insult towards her. The Goddess is in close relations with Taokaka due to finding her lands beautiful and worthy of note. She also seemed to enjoy the strange, but beautiful dangers that the forests have to offer such as the ferocious animals and plants. Beauty does have it’s thorns, after all. In Lore, the goddess Sayuri was said to have mingled with many humans, and other creatures within the world. Creating divine touched subjects known as “Nymphs” that would help protect the beauty in which she created in the world. These children, were said to be enchantingly beautiful… so beautiful that some men feared them because they could not resist the temptation that Sayuri’s children were able to create. Other stories in Lore say that Sayuri was a bit flighty, and had several relations with other gods. While some considered this to be promiscuity, her priestesses considered this to actually being Sayuri’s way of creating bonds and alliances with other gods. This holds true, as Sayuri truly seems to have no enemies within the divine. Though she is very biased and favors Lord Draconious Eflria, and is very infatuated with him. The goddess has a very strange alignment. She is neither god, or evil. Instead, she remains neutral and doesn’t seem to get involved with the quarrels between the gods, but instead tries to solve them and create peace, which usually doesn’t work. Her having no enemies gives her some favor with them all… while some other people believe that she has no enemies because no considers her worth the trouble. Sayuri’s dogma is simple, it’s to spread beauty amongst the lands. She teaches her followers how to be persuasive, convincing, and beautiful. Though don’t think her followers are pacifists, because they are not. Another gift Sayuri, beauty is just as much as a weapon as it is a gift. Just like their goddess, her followers are manipulating, shallow, vain, and whimsical. Sayuri, though rarely in battle wields the Sash of Radiance, a beautiful piece of cloth that she usually wears around her clothing. But when in combat she can activate this into a powerful whip like tool, the Sash of Radiance's measurements are unknown and is said to stretch to the users will. Thus, the range is unlimited. This Sash has the power to absolutely enchant and enamor the target to fall in love with the user, and bend to their will. The Sash of Radiance cannot be used by mortals unless it is deemed so by Sayuri. The Church of Sayuri is a organized church usually covered in beautiful forests and flowers, protected by the priests and priestess's who are enigmatically beautiful. Nymphs run freely in their forests and also protect their churches. Nature: Ephaesus is a scholarly deity, who spends much of his time deep in thought as he seeks to uncover the next cosmic mystery which only He truly understands. In His quest to understand everything, He encourages His mortal followers to do the same. He also seeks to improve all things in creation, to make them better than before. The force of growth is often associated with good, although it is impartial, improving all things good and evil alike as it flows through the universe. Growth is a powerful force of change in which all things benefit from, molding the life given to them at birth into something better each moment they are alive. Ephaesus is heavily associated with the force of progress in the world, and the slow march of improving the understanding and lives of all mortals. Progress marches forward without heed to neither the abolishment of old systems nor the formation of new ones. Ephaesus is often depicted as an older man, with a beard of varying sizes and types, and sometimes a balding head. He is nearly always depicted wearing robes, although the materials and designs vary. It is not at all uncommon to see him depicted with plants growing up from under his feet. In his hands, often appear two items - a leather-bound book titled "Grimoire Scientias", said to be the gathered knowledge of all living beings, and his staff, Dreamweaver. Dreamweaver is smooth across its length, yet appears as if cut marble or pearl; on its top rest three simple white spheres. While Ephaesus very rarely finds himself in conflict, Dreamweaver is said to be intelligent and the two often discuss matters of cosmic importance of philosophical intrigue, challenging each others' wit. When combat is unavoidable however, Dreamweaver is able to shape the world, its functions, and the opponent's thoughts as Ephaesus sees fit, bringing forth a growth of inanimate objects to bar paths, elements to harm, or the opponent's worse nightmares. Dreamweaver is impossible to be found by mortals unless it or Ephaesus desire so. Holy Symbols of Ephaesus are typically made of silver or gold inlaid with a single large gemstone of various qualities or worth, typically towards the green or blue hues, and preferably transparent. Around the stone an eye shape is carved. Devout clerics bearing the symbol are almost never plagued by nightmares, and quite often see prophetic or inspiring dreams. The church of Ephaesus is heavily involved in educating the world, although there is some controversy within the church on which classes and types of people should be educated. Most temples of Epheasus are also schools, which commonly teach language, mathematics, geography, the physical sciences and art. The temple is also heavily involved in exploring and mapping of new places. The Lord of Growth is commonly followed by lorekeepers, scientists, inventors, explorers, and more recently Arcane spell casters of all kinds. Nature: Memnos is best known among mortals for his role in giving them their yearly harvest, just as the world begins to slow into the lull of winter. Memnos is a stern deity who seeks to prepare the people of the world for the lull of winter, and does not tolerate laziness nor inaction. Memnos is depicted by mortal artists as a stocky, strong man usually wearing platemail or other metal armor. His features are usually broad, with a square jaw and tightly cropped hair. He is commonly posed with his arms crossed aloofly, or wielding his armaments combative pose. Lord of Autumn is said to wield the Earthreaver, a heavy flail that is believed to have been forged with an alloy of adamantine and granite in the heart of the eldest, fiercest volcano, with its spikes shaped to resemble the thorns of autumn roses. In his other hand is Primal Aegis, a large shield of ancient oak bark, covered in a layer of red leaves and framed in deer horns. Tales go that a single swing from Earthreaver can crush a mountain into pieces, and pounding it to the ground causes the earth to writhe in agony, provoking earthquakes that devastate the land for miles. Anything made of stone or metal bows out of the way of its swing, leaving anything else to face the power of an avalanche. Tales also mention that anything made from natural materials -processed or not- refuses to touch the majesty of Primal Aegis. Mortals would easier lift a mountain than Earthreaver, and protect themselves with dry leaves, without Memnos' permission. Holy Symbols of Memnos are often made of a thin layer of granite or marble, or dried elder wood (commonly oak or ash), formed into a leaf. If worn, its stalk faces upwards. They are generally painted in pale yellow, faded red or light browns, or any combination thereof. The symbol of a devout cleric is harder than metal, despite the fragility of its material. The church of Memnos is a common sponsor of the armies of the world, striving to keep the world's protectors as strong and able as possible. The church also works extensively with farmers to raise stronger crops and livestock, seeking to safeguard the food sources of the world. Many monks were taught by the church of Memnos, as the schools of monks connected to Memnos are focused on instilling supernatural toughness into their students. The church also sponsors a sect of paladins, who seek to protect civilization from the many evils it faces, as well as finding and destroying evil within civilization. Paladins of Memnos are often also guardsmen/women and detectives. Alternatively, several of the world's long past tyrants were also worshipers of Memnos, their harsh lash backed by the opinion that it is they alone who knew what was best for the world, and by extension, Memnos himself. The Lord of Autumn is often revered by guards, warriors, farmers, rulers of all kinds and nobles. Nature: Leeya is a warm and kind, although accepting all the things that life brings. She acts as a mother figure, at once kind and nurturing but also stern in her quest to improve the behavior of mortals. She seeks to reveal all truths. Birth is the force in which all life is brought into the world. From the smallest saplings, to the largest animals, to the most saintly of saints and the most vile of evils, the force of life is given to them all. Life is the condition of all mortal beings, and all experience it differently. It is said that Leeya chooses the souls of mortals from the realms of the Overseers to breath life into yet again, with no memory or realization of any past experience. With Life, comes light that can illuminate all truths, but just as easily can blind them when too great. The sun is the source of all life energy, and Leeya chose the moon and stars to be given as well so that mortals need not exist in a world of perfect darkness for any amount of time. Her light is almost always visible in some form while above ground. Leeya is a deity whose depictions are extremely varied, although always female. The age, countenance and clothing all vary widely, however the most accepted forms hold features which can only be described as motherly. Leeya is said to be seen most often unarmed. When she does decide to use a weapon, she summons Revelation, a length of pure white light in her hand, which she uses as a staff or spear. Revelation's brilliance is so intense that it is painful to anyone dishonest or hostile. Its point is said to be able to pierce through darkness and deception as easily as it passes through enemies of Life. Speaking falsehoods in the presence of Revelation is borderline impossible. Revelation is immaterial and thus unusable by mortals unless Leeya deems them worthy to touch it. Holy Symbols of Leeya's are single four-pronged stylized stars within a circle. They are most commonly made from silver, gold, platinum, mithral or any other highly reflective surface, occasionally mirrored (especially silver and mithral). They never tarnish as long as the bearer is devout, but the clerics still polish them diligently. The church of Leeya is not well organized, but very popular with the lower classes, especially farmers. Clerics of Leeya often act as midwives and local healers, particularly those further gifted with her touch. Other followers are adventurers, often seeking out some truth. Many still are astronomers who map the heaven's in Leeya's name. Shamans also endeavor to aid in Leeya's work in ushering new souls into the world, and finding any that might escape the cycle of life. The Lady of Birth is a popular choice for healers, shamans, politicians, village-living commoners, adventurers and seekers of truth of all kinds. Worshipers Mages/Sorcerer/Wizards (mainly pyromancers), Clerics, Pyromaniacs. 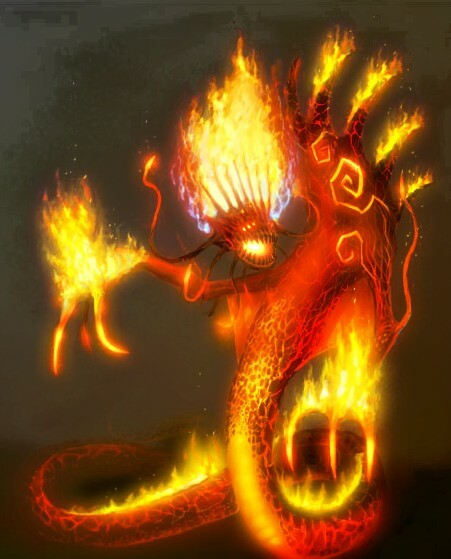 He is the strongest of the Elemental Lords/Mistresses as Taokaka and the Water Lord has les land to rule over considering that his elemental minions is what keeps the core of the planet going, he is usually worshipped by priests and even doctors at times due to his portfolio of purification. Ag’haron possesses an unquenchable thirst for power and a ruthless personality. Equally willing to manipulate friend and foe alike, he constantly tries to better his station in life through any means possible. Even though Ag’haron constantly tends to be embroiled in many different plots and schemes, his overarching goal is always to gather enough power to then overthrow the rest of the gods and to claim their divine powers and portfolios for himself. Nothing else matters in comparison to this quest, and Ag’haron is willing to betray his own people and sacrifice his closest friends to achieve it. Ag’haron can only be trusted to do what is in his own best interests. He often freely offers wealth to people in exchange for clues or information that might be useful, and then has them killed and reclaims his payment. Ag’haron only truly trusts people who are like himself — those who are openly ambitious and who will do anything to improve their lot in life. He feels that those people can be most easily predicted and manipulated through offers of wealth or prestige. It is the people who serve higher moral or religious powers that he fears. They are often resistant to his lures, and in Agharon’s eyes can never be completely trusted or relied upon.